A lot of people are not aware of the fact that they have keloids. A keloid is a scar or a scratch. If you are among the people who are aware of having keloids then you should read about the10 Natural Remedies to Remove Keloids. 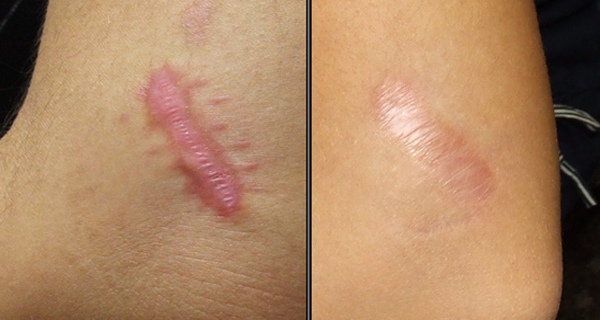 A keloid scar is benign and not contagious, but sometimes accompanied by severe itchiness, pain, and changes in texture. In severe cases, it can affect movement of skin. Keloid scars are seen 15 times more frequently in highly pigmented ethnic groups than in Caucasians. It is also known that the keloids are scars that won’t stop. It rises above the rest of the skin. How do keloids form? They usually show up after an injury or a surgery, but can also appear due to inflammation or spontaneously. Learn about the 10 Natural Remedies to Remove Keloids. Lemon juice: The main components of the lemon are Vitamin C and antioxidants. These two components have been known for being very helpful in treating various types of scars, including keloids. You should know that the lemons should be fresh in order to make the lemon juice and then apply it to the affected area. Remove the lemon juice 30 minutes after you apply it on the problematic areas. Baking soda: Baking soda exfoliates the skin. Make a paste by mixing 3 parts of peroxide andone part of baking soda. Apply the paste directly on the skin if you want to speed up the process and reduce the inflammation. Aloe Vera: Aloe Vera has been used for many purposes. This time you can use Aloe Vera because it helps with the keloids. Aloe Vera helps heal damaged skin; it reduces the inflammation, and keeps the skin moisturized. Before you put Aloe Vera on the keloids, clean your skin with lukewarm water. Lavender oil: This amazing oil can rejuvenate your skin. It helps with the scars, it helps with increasing the skin cell turnover and this is how it actually prevents scars from becoming permanent. Apply lavender oil and massage it for several minutes. Sandalwood and rosewater: Rosewater has been long known for being a natural skin toner. The sandalwood on the other side has been known for its skin regenerating properties. Make a mixture out of these two products and the result should be a thick paste you apply to the problematic area before going to bed. Wash it in the morning with lukewarm water. Honey: Apply fresh honey to the scar and massage. Honey helps with moisturizing the skin and healing it. Applying fresh honey will help the accumulation of dead skin cells and improve your blood circulation. Fuller’s earth: This is a mix of one teaspoon of a rose water, one teaspoon of lemon juice and a tablespoon of fuller’s earth to make a paste. Apply the mixture and massage gently until the scar becomes soft. Repeat the process right away, but first let the skin to dry off. Leave the mixture for 10-15 minutes, and then wash the area with cold water.